If John Updike was the Fred Astaire of poetry – nimble, dexterous, witty, graceful – J. Allyn Rosser is the Ginger Rogers – witty, nimble, graceful, seemingly doing it “with the greatest of ease,” as though soaring on a flying trapeze. As they said of Ginger Rogers, she could do everything Astaire did, and on high heels and backwards. There’s an element of Erma Bombeck’s sardonic humor in Rosser’s poems, but add to that the graceful, seamless use of rhyme, meter, poetic form, and she has you waltzing from page to page, speaking Tagalog in Manila or “wiseguy” in New York, pirouetting through museums, cemeteries, malls, with odes to loss, failure, futility and break-up that evince just enough metaphysical speculation to make John Donne and Andrew Marvell drool; odes to a comforting, comfortable old shirt, pelicans and Canadian geese, seemingly almost any old thing that captures her attention. Two poems stand out as particularly impressive tours de force, if only for their sheer length as lyrics. Rosser’s wit and insight are on display in the title poem, a five-page narrative about the speaker’s great-grandmother Mimi, who ran off to join the circus, leaving her son Louis behind. The narrator relates the tale to a friend while giving her a tour of her home. In the study they come upon the trapeze. The tone is conversational, confidential, even as the story is a bit jaw-dropping, not to say scandalous. 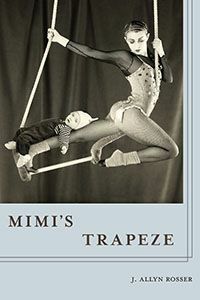 Mimi does return to her family, briefly, but then disappears again, this time for good, though she leaves the trapeze for her son. God knows why, to me. The other poem is from the second of five sections – poems that all seem to address issues of art and performance (including one, “Let’s Face the Music and Dance” that deals with Fred and Ginger!). “Judith Bearing the Head of Holofernes” is a witty, amusing, insightful and wise meditation on the depiction in art over the centuries of the Biblical story of Judith. Holofernes, a general in Nebuchadnezzar’s army, was going around destroying all the gods of the nations in the region so that they’d worship Nebuchadnezzar (6th century BCE king of the Babylonian empire, famous for constructing the Hanging Gardens of Babylon and destroying the temple in Jerusalem). Of course, when it came to attacking the Jews and replacing their god, he met his match in Judith (proxy for capital G God, of course). She got him drunk, seduced him, and then beheaded him. This has been a popular scene to paint, particularly in Italian Renaissance art but even in modern times, the decapitation of the tyrant by the avenging angel, as it were. “Almost every Judith holds him by the hair,” Rosser writes, of the severed head. But in Ghirlandaio’s case “Judith balances Holofernes’ head/in a basket of her own, like a demented/Carmen Miranda,” and “Giorgone’s Judith places her foot on his hair/presumably in triumph, but clearly also/to keep the head from rolling.” In similar amusing fashion she analyzes Caravaggio’s, Artemisia Gentileschi’s, Jacopo Palma the Elder’s and several other artists’ interpretations of the scene, and she gets into Judith’s head herself, as well. It makes you want to look at these paintings yourself! Try this link: http://en.wikipedia.org/wiki/Judith_Beheading_Holofernes. Rosser takes us on a delightful little stroll though art history in this poem, an entertaining teacher lecturing her class. As mentioned briefly already, Rosser delights in poetic form as well as free verse. There are a number of sonnets in this collection, all rather clever and amusing, marked by her digging wit. “Final Invitation,” a sort of RSVP to potential guests, that turns out to be about dying (BYOD – bring your own dust), ends the third section. “Ambitions Futilities,” “In the Middle of the Old Man’s Talk,” “Sonnet Predicting the End of the World with Bumper Stickers,” “Angel Junkman at All Souls’ Abyss”: the very titles tell you how fun these are going to be. Other poems make use of rhyme in couplets as well as other more ingenious arrangements. The true sign of a talented poet is that you don’t particularly notice the rhymes; nothing feels forced. For me, Rosser’s choreographed wit, dexterity, her acrobatic artistry, her sharp, clever conclusions are best captured in the hilarious poem called “Summer Olympics Look,” from the fourth section. because the sixth was busy in the kitchen. fresh daisies on the mantel and by the door. but his come out had been a tiny bit clumsy. still frosty, darkening the coaster at his elbow. her arms crossed in a kind of tuck position. hardly a ripple there in the room among us. How cleverly she uses the language of Olympics competition (is there even such a thing as a “one-and-a-half triple twist”?) and judging to skewer Jane’s “future ex-husband,” who scores 10’s across the board demonstrating his boorishness. J. Allyn Rosser is entertaining as hell, and she can even be instructive. Welcome to the Chamber Four archive! For nearly six years, we at Chamber Four wrote book reviews and blog posts about books and publishing. We've finally hung up the spurs, but didn't want to simply delete all that work, so we've parked it here. There are a few formatting issues with these posts, but the content survives. Look below for links to categories (like Great Reads, and our feature series).